Joyce Diane Brothers (née Bauer; October 20, 1927 – May 13, 2013) was an American psychologist, television personality and columnist, who wrote a daily newspaper advice column from 1960 to 2013. In 1955, she became the only woman ever to win the top prize on the American game show The $64,000 Question, answering questions on the topic of boxing. In 1958, she presented a television show on which she gave psychological advice, pioneering the field. She wrote a column for Good Housekeeping for almost forty years and became, according to The Washington Post, the "face of American psychology". As a psychologist, Brothers had been licensed in New York since 1958. Brothers appeared in dozens of television roles, usually as herself, but from the 1970s onward she accepted roles portraying fictional characters, often self-parodies. Radio therapist Laura Schlessinger credited Brothers with making psychology "accessible". Joyce Diane Bauer was born in Brooklyn, New York. Her family was Jewish. She graduated from Far Rockaway High School in January 1944. She entered Cornell University, double majoring in home economics and psychology and was a member of Sigma Delta Tau sorority. She earned her Ph.D degree in psychology from Columbia University. 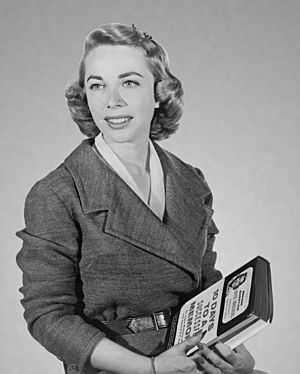 The American Association of University Women AAUW awarded Brothers the American Fellowship in 1952, which enabled her to complete the doctoral degree. She married Milton Brothers, an internist, in 1949. The couple had a daughter. Milton Brothers died in 1989 from cancer. Brothers died, aged 85, at her home in Fort Lee on May 13, 2013, due to respiratory failure. She is survived by her four grandchildren, three great-grandchildren, and a sister. The Washington Times called her "the mother of television psychology". She is credited with inspiring "Dr. Laura" Schlessinger and "Dr. Phil" McGraw who called himself "a very big fan of hers" after her death. Brothers has also been on many TV programs, these include The Nanny, Melrose Place and Frasier. 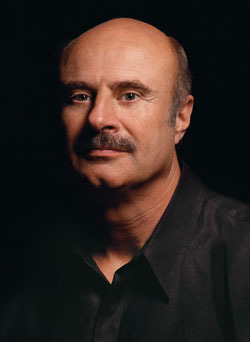 "Dr. Phil" McGraw called himself "a very big fan of hers"
Joyce Brothers Facts for Kids. Kiddle Encyclopedia.